(CNN) -- When newly minted West Virginia Schools Superintendent Dr. Steven Paine told parents, teachers and educators in 2005 that he wanted to use Finland as a model for their education system, he got a lot of blank stares: Finland? What, people asked, does West Virginia have to do with Finland? The contrast couldn't be more stark: In West Virginia, many children face poverty, illiteracy and broken homes and lack easy access to health care or proper nutrition. Finland has a largely literate and relatively homogeneous population, little immigration and almost no poverty or social problems. They also offer a vast network of social supports including free meals and health care for school children. Still, Finland was -- and remains -- at the top of international test rankings for elementary through high schools and after studying and observing Finnish schools for several months in 2004, Paine was convinced they had useful things to teach West Virginia. But rather than concentrate directly on test scores, Paine thought West Virginia should concentrate on developing more rigorous standards, curriculum and perhaps most importantly -- teacher supports. Here he was on shaky political ground: Raising test scores has become the central goal of a growing chorus of those trying to improve U.S. education. Former West Virginia Schools Superintendent Steve Paine went to Finland to learn to improve West Virginia schools. But Paine thought an overemphasis on standardized tests leads to a narrow, unimaginative curriculum that isn't in the best interests of kids. Develop the right curriculum, standards and teacher supports, Paine said, and test scores will take care of themselves. In this, he was following Finland's lead: Finland doesn't use standardized tests to assess teachers or schools. "If we're going to spend the effort and money necessary to raise standards," Paine said at the time, "we might as well shoot for the top and align them with the best practices for global achievement, since that's where our young people are going to be competing in the 21st century." Paine did not help his case when he warned of a short-term drop in West Virginia's standardized test scores. This was the toughest part for many parents and educators to swallow. It flew in the face of major federal funding initiatives such as No Child Left Behind and later, Race to the Top -- funding that a poor state like West Virginia could not afford to turn away. Lower test scores in the short term, he said, would be a product of more rigorous tests and passing thresholds, not lower performance. Because federal programs such as NCLB leave it up to the states to define what it means to call a child "proficient," unscrupulous states simply put the proficiency bar low enough to ensure federal funding. In line with his philosophy on standards, curriculum and teacher supports, Paine wanted to put an end to this by aligning West Virginia's testing with national and international benchmarks. Paine prevailed in the end and the result became Global21, a statewide initiative launched in 2005 with the purpose of developing "self-directed, motivated and life-long learners." But West Virginia could not simply transport Finland's system whole -- they had to carefully pick and repurpose policies for their own use. One young Finnish teacher, asked why he went into the profession, told Paine: "Because it is the most honorable of all professions. It is a patriotic, national calling to be a teacher." But what he learned in Finland, Paine said, is that the respect must be more than just lip service. Administrators in Finland really listen to teachers, then back up their words by giving teachers autonomy and resources, said Paine. "If you want enduring, lasting student learning, there's no easy way around that but to invest your time and your resources, including money, as close to the classroom as you can possibly get and that's with the teacher." Part of this investment is in initial teacher education. In the U.S., most teachers accumulate debt paying for their education, teacher-mentoring is rare and training ranges wildly from a few weeks of training in alternative teacher training programs such as Teach for America to world-class four-year and graduate college programs. In Finland, by contrast, teachers train for free, receive a stipend and begin hands-on teaching with a mentor almost immediately. All school teachers must hold a master's degree in addition to four or five years of undergraduate training to be permanently employed, and teachers without a master's are given time and resources to get it. And it turns out that well-respected, well-educated teachers stick around longer. In the United States, teachers leave the profession at almost three times the rate of Finland's teachers and a third of all new U.S. teachers leave the profession within the first three years -- the less experienced a teacher is, the more likely he or she is to leave teaching, according to statistics from the National Center for Education Statistics. And some research shows that teachers with less training leave more quickly and more often. Poca High School teacher Sonjia Richardson, center, works with her students. But according to Paine, it is in professional development -- after teachers have their degree -- that Finland really shines. Finland's teachers spend about half their school time planning with colleagues, working with parents, and taking part in high-level professional development, said Paine. Professional development became a centerpiece of Paine's approach in West Virginia. Though professional development was part of West Virginia's system before Global21, not all professional development opportunities are created equal, said Sonjia Richardson, a 12-year veteran of the West Virginia school system. "My first probably four or five years of teaching, the State Department of Education was this entity that you heard about, but you never saw," she said. But since Global21, "They have really gotten involved in the schools. They're talking to teachers. They're talking to kids." Rather than using outside experts, there was a real push by the state, said Richardson, that teacher development be created by teachers and delivered by teachers. West Virginia's Teacher Leadership Institute is particularly impressive, she said. 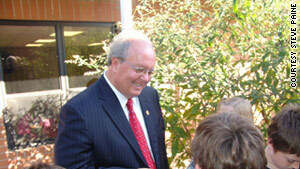 It was through a seminar put on by the institute in 2008 that Richardson learned about one of the major initiatives of Global21: project-based learning. It turned out to be a major watershed for Richardson as a teacher. "It was a pivotal moment in my career," she said. "It changed significantly what I do in the classroom." Project-based learning -- an integral part of Finland's education system -- uses one "project" as a starting point for learning about multiple subjects and how they fit together. For example, Paine, a former math teacher, describes one Charleston, West Virginia, school where a car accident between two teachers in a school parking lot was used as a starting point to learn about geometry, civics, law, engineering and public speaking. Students were asked to redesign the parking lot to minimize the likelihood of an accident and maximize the number of spaces. But first, students went to the city manager to figure out the legal requirements for a parking space. Then they had to calculate the perimeter of what they thought was a rectangular space but turned out to have several nooks and crannies for more spaces. "They measured the space of about four or five different areas and then they had to calculate the square footage -- now you're in the multistep calculation," Paine said. Finally, students were asked to try and determine who was legally at fault in the accident and present and defend their proposals for an improved parking lot to their peers, school officials and parents. 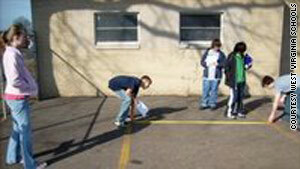 West Virginia students work on a project-based learning plan to improve a parking lot. "That's really engaging kids in project-based, deep-thinking types of learning that I saw in Finland, and that's what we tried to replicate in our state," Paine said. And not coincidentally, just the kind of pragmatic, complex, collaborative problem-solving that companies say they need in the 21st century workplace. But when Richardson first tried to use project-based learning in her classroom, she ran into reluctance from students. "They weren't used to the collaboration. They weren't used to the amount of technology that was integrated into the project," Richardson said. "And they weren't used to giving the presentations like they were required to do with the project." "But as they worked through it, I saw significant growth in all those areas -- technology, collaboration, presentation. They became less apprehensive." When her students presented their first project -- a video documentary on how teens influence pop culture -- Richardson was astounded at the final result. "The first project I did -- after it was done -- I said I would never go back to the old way of teaching, because it was that valuable." "I wanted to cry because I could see how much progress they had made from beginning to end." In a more recent project, Richardson was surprised when her students became so invested in a project to reduce poverty in their area that many of them became genuinely upset when they found out that their plan would not be enacted. Project-based learning has also won over reluctant parents, at first suspicious of the new approach. "The parents that have worked with us have really come on board and see the relevance of problem-based learning to their children's education," Richardson said. Since that 2008 seminar, Richardson has worked on numerous projects with her sophomore high school students and has integrated project-based learning concepts into her regular teaching. "In project-based learning, the teacher's role is so different than the traditional teacher role. ... You're not up answering the questions, giving the information. You're more of a facilitator, a guide, a coach." She has also been asked to help teach other teachers on project-based methods and contributed to West Virginia's Teach21, a resource that has lesson plans and project-based learning plans that teachers share with each other. The site has developed an impressive following, attracting nearly 15,000 visits a month from 88 different countries. And West Virginia's commitment to teachers continues to impress her. New state schools Superintendent Jorea Marple teaches in a West Virginia classroom in 2011. Recently, West Virginia's new superintendent, Jorea Marple, a lifetime educator and Paine's former deputy, impressed many teachers when she went straight into the classroom after her appointment this year. "She didn't just do a walk-through or a drive-by. She went in and shadowed these teachers and worked with them, and she went into some of the most impoverished parts of our state," Richardson said. "That really meant a lot to teachers." "They value us, and there is this sense that they really and truly care about our kids. And that probably seems like it should be a no-brainer, but really it's not. Sometimes things get so political that the kids are left out of it altogether." It remains to be seen whether West Virginia's test scores will "take care of themselves," but in the short term, they appear to be holding the line. Though comparisons are difficult due to different tests in each state, West Virginia's most recent results are in line with other states that have similarly NAEP-benchmarked tests such as Nevada and South Carolina. Paine is pleased with the results, but he cautions against focusing too much on the narrow and sometimes misleading indicator of standardized test scores. "If you have teachers who had low test scores -- fine -- use that as an indicator to dig deeper to find out what's going on in that classroom because test scores could be an indicator that we have a problem. But they shouldn't be the end-all in the game." That approach can be a hard sell to politicians looking to show results to constituents. Test results are much easier to quantify and recite in a speech, than for example, project-based learning results, said Paine. And yet, standardized tests don't drive the best education systems, like Finland. "As we look at the top performing countries -- honestly, they don't chase standardized test scores," said Paine. Instead of standardized tests, Finland uses teachers to assess its schools, teachers and students. Assessments are made on a continuing basis by teachers and administrators with special qualifications and training and professional development plans are customized to meet teacher or student needs and backed up with resources. "You have lead teachers, master teachers and principals who are well-trained in terms of what to look for in a classroom when they go through teacher evaluations," Paine said. West Virginia is trying to follow this model by keeping stress on standardized tests low and developing a cadre of specialists to make classroom assessments and putting substantive resources at the disposal of teachers. Compare that with Atlanta Public Schools -- site of a recent standardized test cheating scandal -- where standardized test scores could make or break a teacher's career and a "professional development plan" was often nothing more than a veiled threat, signaling the first step to losing your job. And pressure to rely more heavily on standardized tests as assessment tools for schools, teachers and students is only increasing through federal programs like No Child Left Behind and President Obama's Race to the Top. It's important to keep in mind the massive political and social differences between the United States and Finland and "we obviously shouldn't adopt policies just because Finland uses them," said Mathew Di Carlo, senior fellow at the Albert Shanker Institute, a nonprofit education research organization. Take just one example: Charter schools, a major part of the education reform movement in the United States, simply don't exist in Finland. Still, the Finland has much to recommend it, and West Virginia appears to have zeroed in on some of the best, said Di Carlo. As for the rest of the United States, however, he is not so sure. "For whatever it's worth, the three policy measures that are currently receiving virtually all the attention in the U.S. -- charter schools, removing tenure protections, and tying teacher pay and evaluation to test scores -- all fly directly in the face of the Finnish system." "It seems clear, at least from our national discourse, that we're not really learning much from Finland.